Do you remember loving cowboy cookies when you were a kid? But now that you have to be gluten-free and dairy-free, you think you will never eat them again? Time to make some cookies. This happened a few weeks ago. Unexpectedly, Dan and I made the food for a an enormous wedding party, which needed to be gluten-free and dairy-free. Six dishes for 140 people. The bride lived down the street from the first house we lived in when we moved to Vashon seven years ago. She was a teenager then, just about to graduate high school. Now she has a Master’s in epidemiology. She’s a wonderful young woman. And she was marrying a wonderful young man, the son of another family we know on the island. One morning, a few weeks ago, the mother of the groom came up to us in a restaurant and said, “This must be kismet. I’m supposed to call you.” The family had picked out caterers for the night-before-the-wedding party, but they felt not sure of the ability of those folks to make everything completely and entirely gluten-free. The bride and her mother have celiac. The brother is deathly allergic to dairy. They had fretted, then someone said out loud, “If only Shauna and Dan could make the food.” Turns out, we could. We gathered, the bride her mother and the mother of the groom, around our table a couple of weeks ago, to talk about the food. We wanted to make something meaningful for them. We asked about food memories and meals the young couple had shared together. Whenever we cater, we don’t bring a set menu. We always make it just for that occasion. So we asked and talked. Dan came up with a list of dishes: a smoked salmon platter with capers, red onions and preserved lemons on multi-grain crackers; a summer vegetable pasta salad; a taco bar with slow-braised carnitas, fresh salsa, smoked jalapeños, pickled slaw, and corn tortillas, grilled mushrooms marinated in sherry vinegar with cilantro, and a play on caprese salad with prosciutto in place of the mozzarella. Everyone was so happy. And then it was time to talk dessert. Done. We would have cookies and cake for the party. I had somehow never eaten cowboy cookies before. 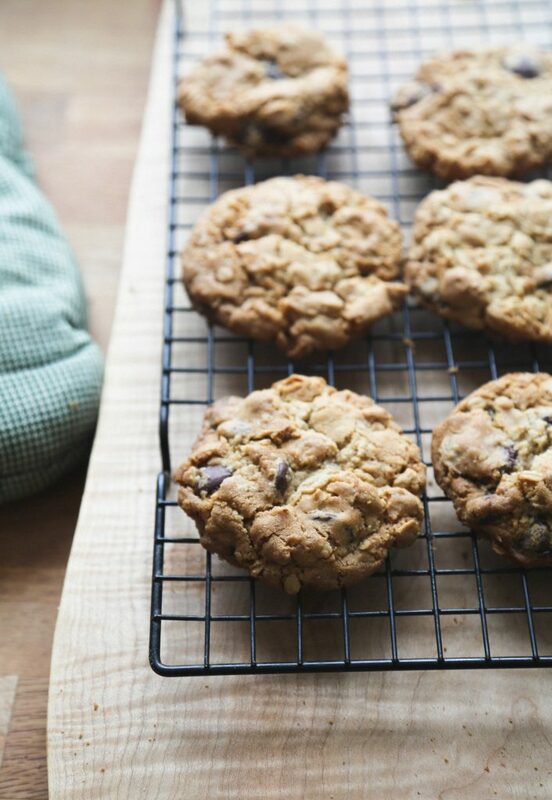 Also referred to as ranger cookies, monster cookies, and Laura Bush cookies, these cookies are a cross between a good chewy chocolate chip cookies and oatmeal cookies. Um, why had I never made these before? Gluten-free? Easy. Use our all-purpose flour. I haven’t met a cookie yet that wilts with this flour. It works. How to make them dairy-free? That was easy too. The original recipe, written in a firm hand and faint ink, used shortening. Shortening has faded in popularity. For awhile, it was full of transfats and verifiably bad. But even Crisco is essentially trans-fat free now. Butter is lovely. I adore it. The taste of butter makes some darned fine cookies. However, shortening makes a great fluffy cookie batter, a smooth confluence of eggs and flour, chocolate chips and oats. Shortening holds it all together with no fanfare or assertive taste of its own. To be honest, I might prefer shortening to butter for cookies. Or at least half and half, like I do in my pie crusts now. The texture of shortening, the taste of butter. And when you need a cookie to be entirely dairy-free, shortening is a gift. Watching Dan work in the kitchen is one of my greatest joys. I was his assistant, in awe of how he works hard, runs fast, gets stuff done, and goes back for more. You’re my hero, Dan the man. And he was so damned happy all day, making food. I’ve got to get this guy back in the kitchen. That is why we do the work we do. Crisp on the outer edges, chewy in the middle, these are also a little lacy from the shortening. We’ve made dozens of them now, thanks to making a huge number of them for a party. And the kids are still eating them, happily. If you don’t like to use vegetable shortening, you can use coconut oil instead. It will be a stronger coconut taste but that isn’t bad. Combine the dry ingredients. in a large bowl, whisk together the flour, sad, baking powder, and salt. Set aside. Cream the shortening and sugar. Put the shortening in the bowl of a stand mixer. Put on the paddle attachment. With the mixer running on low, add the eggs, one at a time. When the eggs are fully incorporated, and the mixture looks a little like fresh ricotta (like curds, really), add the brown sugar and white sugar. When the sugars are fully incorporated, the mixture should be light and fluffy. Add the vanilla extract and oats. Mix in fully then turn off the mixer. Finish the batter. With the mixer running on low, add the dry ingredients, 1/4 cup at a time. Scrape down the sides of the bowl after every few times you add flour. When the flour is fully incorporated, add the chocolate chips and mix for 30 seconds or so. Refrigerate the batter. Put the dough in the refrigerator for at least 1 hour. Ideally, to develop the flavors, you would refrigerate it overnight. Prepare to bake. Heat the oven to 375°. Line a baking sheet with parchment paper. Bake the cookies. Form 1-ounce balls of dough. (That’s about the size of a golf ball.) If the cookies are all the same size, they will bake evenly. Lay the balls of dough in 3 rows of 3, evenly spaced, on the prepared baking sheet. If you wish, sprinkle a bit of sea salt on top of each ball of cookie dough. 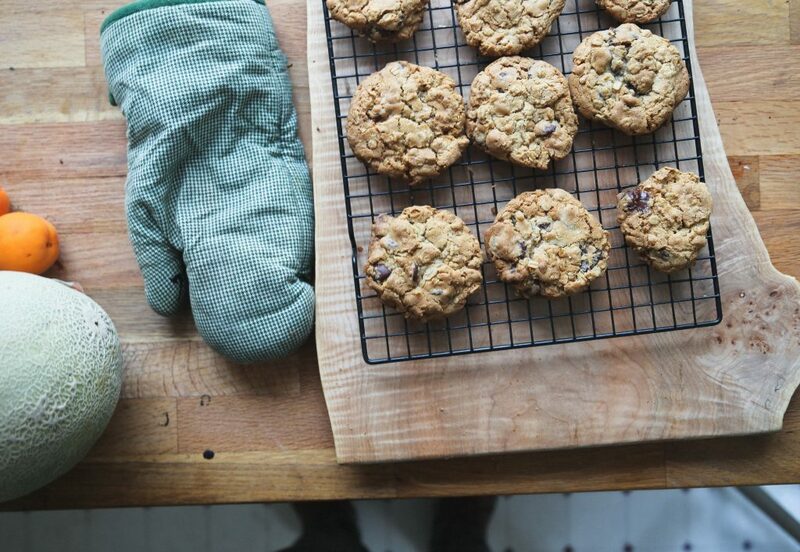 Cool the cookies on the baking sheet for 10 minutes, then transfer them to a cooling rack. Repeat with the remaining cookies until the dough is fully baked. Feel like playing? This is the basic template recipe. You could easily add cinnamon or nutmeg, depending on your taste. Try replacing half the chocolate chips with pecans or walnuts instead. I’m not a big fan of shredded coconut in cookies, but you might be!